With such a large number of "Do It Yourself" Ant Treatment products on the market, most customers come to us after trying to tackle the problem themselves. Spraying bench tops with surface spray can actually be detrimental to combating your ant issue. Once ants detect the spray they will take refuge back into the wall pushing the nest deeper in hard to reach cavities. Sure you might kill the few you spray but to effectively make an impact on the nest you have to use slow to activate chemicals. This better the chances of it being passed around in the colony. So the best thing to do is act fast and get a professional in to stop a small ant problem becoming a large infestation. Apart from painful bites to people and pets, ants can also create a more serious issue in the home. Ants foraging from the outside in are capable of spreading disease through exploring food sources like dead insects, dead animals, faeces and decomposing plant matter. Then they march disease filled micro organisms through your clean environment like the kitchen and pantry. Living in South East Queensland we are in the High Impact Zone according to the CSIRO. We share this high population of black ants with areas further up the coast around Townsville. Why is DIY Ant Control so tricky? Ant Control can be tricky and that's why it is best to have one of our certified and licensed pest control experts come out and identify the problem. Different Ant Species have individual eating, nesting and breeding characteristics which require difference treatment types. Once identified we can carry out the correct method with low toxic chemicals which are safe to respiratory sufferers, allergic reactions, kids and pets. 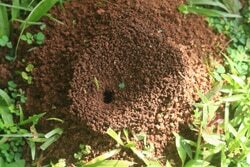 Our Ant Treatment technician will do an inspection for activity in known ant hotspots. Normally you would have seen a long line of ants headed off in a direction. They come into the house looking for sweet sugar based food. Ants will travel far and wide for food and mark any goodies found with a special pheromone so other will be able to locate it. Even in the cleanest of houses ants will find the smallest of crumbs making any home owner feel dirty. With Ant Colonies reaching up to half a million ants it's important to target the correct areas and get your ant problem under control. Although these pests can be seen all year round their most active times are in the warmer months of the year. (1) Inspection - As stated before, an important part of ant control is locating areas of activity and seeing what specie of ant you have in your home. Nests can often be located in appliances, pot plants, walls and ceilings making it sometimes difficult to locate. We look in known areas common for activity and pick up and clues left behind. This also gives us an idea why they are in your house and what food source they are trying to get to. A successful Ant Treatment can be made up from one or all of these methods combined. We have premium chemicals which have a transfer effect that ants pass on to each other through grooming and feeding one another. (3) Baiting - Ant Cafes (Yes you read correctly) are set up in strategic areas of your house and contain a compound suitable to the type of specie invading your home. Ants will be attracted to the cafes and once engaged will pass the chemical onto others. Ants are going to create a nest where they have a warm environment and are free from predators. This means areas like roof voids and wall cavities are a perfect place for them. Applying dusting to the ceiling space in an extremely effective treatment. Internally we are going to use a mixture of gel, granules, a fine misting spray and baits/ant cafes. To help protect the inside we do an preventative edge spray around the external of the house which includes weep holes. We have found this both strengthens and compliments the internal treatments. Seeing a few ants around inside the house is normal and acceptable. Having an infestation is not so that is why we offer a 6 month internal warranty on our Ant Treatment. This is to cover your existing ant infestation inside the house. Protecting the house is the main priority, outside ants can move their nests around to avoid predators and adverse weather conditions. You can help reduce the attractiveness of your home to ants by following these simple guidelines. Use bin liners in household bins and rinse out cans and other containers before throwing them in their bins. Also use smaller bags so you are emptying them out more often. Having a large internal bins gives the ants greater chance of finding this treasure chest. Feed pets outside and away from the house. Also store their food in air tight containers. Follow ant trails and find out where they are coming from and going to. Then seal up these areas making it harder for them to get back in. A proactive approach to Ant Control is with an Annual General Pest Treatment. This treatment is not for specific infestations but will keep breaking any breeding cycles of Cockroaches, Ants, Silverfish & Spiders. No Pest Control company can guarantee complete Ant eradication, we cannot fight nature and a few ants seen here and there is normal in any household. So the plan is to knock your current infestation on the head. With an effect application of chemical then keep them at bay with an annual general pest control. Most clients we have combine their annual general pest treatment with a Termite Inspection for total peace of mind. Call our Ant Treatment Team on 1800UNCOVER (1800862683). Or use our online quote form for a free fast quote within an hour. We do Ant Treatments in Brisbane , Gold coast , Logan and Ipswich.